Feast. Awaze tibbs with gluten-free injera. Merkato Marketplace is in the heart of Little Ethiopia, a small quaint area, two blocks away from downtown Los Angeles. 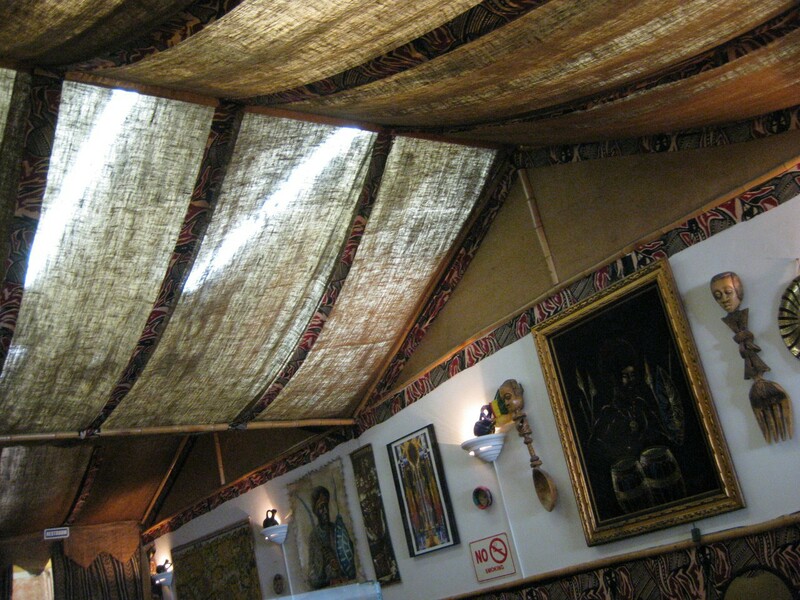 The Ethiopian block houses the ethnic markets that churn out all sorts of authentic Ethiopian spices and delicious food. It was only after I had sat down that I realized that the restaurant and the market were under one roof, and the result was a separate dining area, away from the hustle and bustle of the market, which upon perusal, offered fresh spices, Ethiopian goods, and sweets. In some sense, it’s relaxing to know that the reviews of the market usually correspond well to the quality of the restaurant food; they essentially cook what they sell. Selling spices and Ethiopian goods after obtaining them wholesale in Los Angeles- pretty damn awesome; cooking them up into something delicious and selling a one of a kind culinary experience? Even better. The profit margins on that kind of turnaround shouldn’t be terrible. My friend and I both selected Awaze tibbs, and as per my request, some gluten-free injera, which apparently turns out to be the more traditional way of preparing it. The sourdough teff bread came out the color of café, and was spongy soft. The texture could easily be modified through the flour combinations used for the injera batter (teff, wheat, barley, millet). Teff has its own unique taste, a slight hint of nuttiness and a bit of sourness from the fermentation. It was fairly porous, so grabbing the beef tibbs with it was somewhat a challenge. I was tempted to request a spoon, but that wouldn’t be the proper way to eat Ethiopian food anyhow, as injera is technically considered the utensil. Nevermind the soggy delicious injera, we pressed on. The thinness of the injera made sense; if the batter was cooked on a large surface area, that decreases the potential for vertical rise. What I couldn’t particularly explain at the moment was the numerous small holes found on the injera. The first source (below) states that the liberal use of salt on the mitad (flat-top griddle gig) before cooking aids in the creation of the holes. The video source (also below) states and shows that the eyes naturally form once the batter is spread out and evenly heated; which provided no explanation to me. Before, I thought that the holes were the sole result of fermentation (sort of like breaking open freshly baked sourdough, and looking at the small air pockets formed in bread). This thought was only partially correct. So, I looked into methods of injera preparation that may yield an explanation. 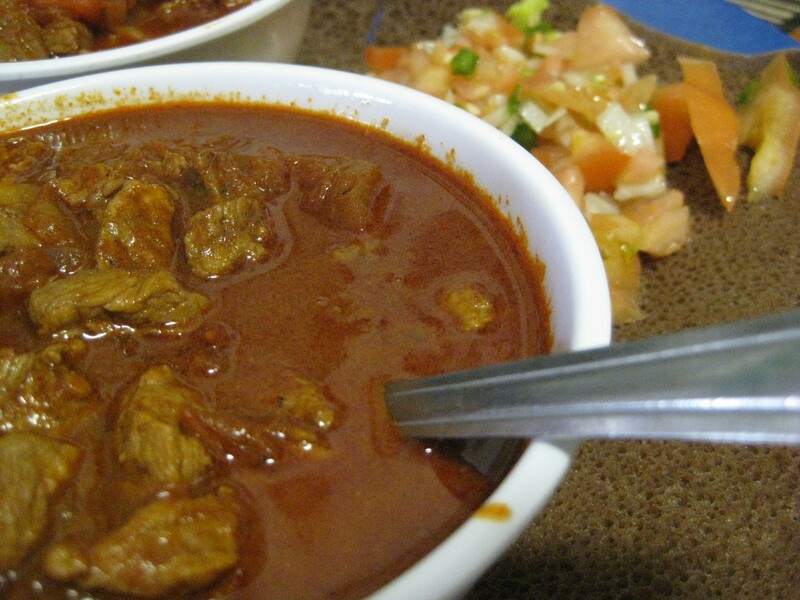 According to the two different sources (located here and here), there are varying methods of making injera; all of them involve a starter (lit), fermentation, an end-product batter that has the consistency of thick water (more liquidy than pancake mix), and a flat cooking top (mitad). The simplified process goes like this. Make starter; let it sit. Make batter; add a bit of starter; add enough water to get the right consistency; let it sit. Pour onto flat cooking top. Optional salt on the bottom. The first source stated that the rubbing of salt on the mitad before the batter pour was important in creating bubbles. 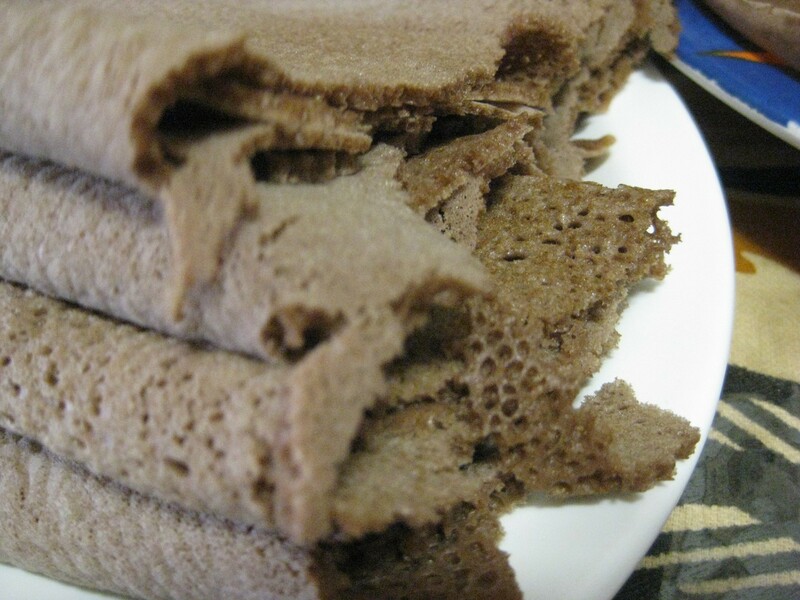 The second source showed that bubbles naturally formed on the surface of the injera, if the batter consistency and fermentation were right. I’m tempted to say that both, in fact, are true, but first and foremost, the batter consistency (through correct fermentation times and starter preparation. Part of the concept is the same as why bubbles arise in bread; in the case for injera, it’s just that the batter consistency is very fluid, and therefore, trapped fermentation gases such as carbon dioxide actually can move a significant distance within the batter. With the case of bread, when temperatures rise from baking, gases such as carbon dioxide expand; this creates bubbles. However, the dough for bread has a strong enough protein network (gluten) to trap those bubbles in. Hence, bread is smooth on the outside, but possesses many holes on the inside. The addition of salt works only in that it creates an uneven surface for the initial batter pour. This traps microscopic air pockets underneath the batter. A good analogy would be trying to lay a rug flat on a bunch of golf balls. 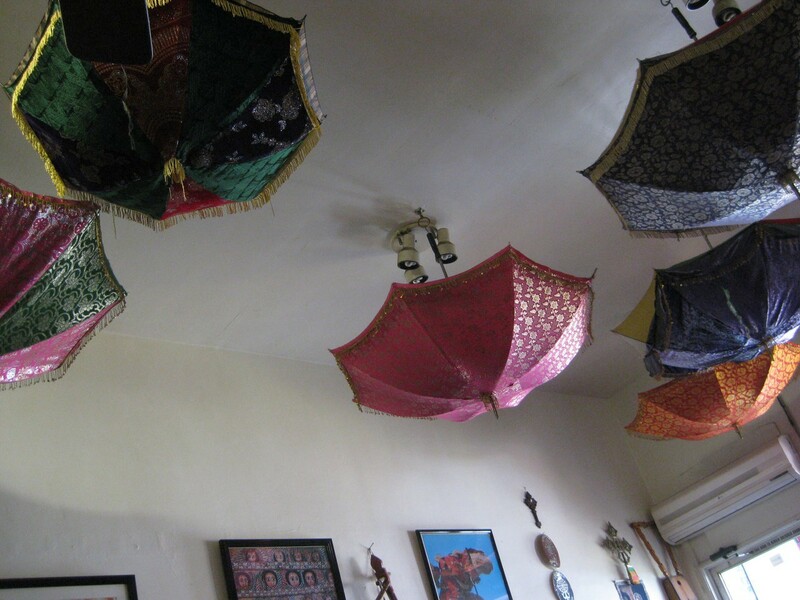 Air gets trapped underneath, and when that air is heated, it rises.